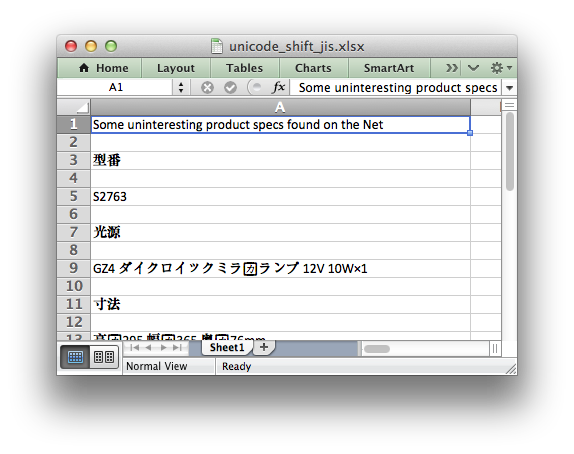 This program is an example of reading in data from a Shift JIS encoded text file and converting it to a worksheet. The main trick is to ensure that the data read in is converted to UTF-8 within the Python program. The XlsxWriter module will then take care of writing the encoding to the Excel file. The encoding of the input data shouldn’t matter once it can be converted to UTF-8 via the codecs module. # the XlsxWriter Python module. # with Shift-JIS encoded text. # Open the input file with the correct encoding. # Create an new Excel file and convert the text data. # Start from the first cell. # Read the text file and write it to the worksheet. # Ignore the comments in the text file. # Write any other lines to the worksheet.